This restaurant in the commercial quarter of the island is a cornucopia of rich Indian flavours, much to Behnaz Sanjana’s hearty delight. Located at the Ramee Grand Hotel and Spa in Seef, Rasoi is the Indian Maharaja residing on the hotel’s second floor. It’s a bright, spacious setting aptly accentuated with gold motifs, giving the space a touch of subtle splendour. 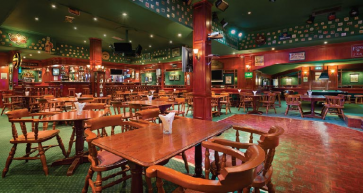 Live music in the evening hours contributes to the royal feel of the restaurant. What I found most impressive was the extensive repertoire of delicacies from the northern regions of the Indian subcontinent. A quick chat with chef-in-charge Kuldeep Ratoori, who comes backed with experience from working with some of the best names in the Indian food business in Dubai, explains it. Papadums work unobtrusively to distract hungry diners from the heavenly aromas floating about, and hardly warrant a mention. But the crunchy crisps at Rasoi were elevated to a whole new level accompanied by spicy green mint, sweet orange-hued pineapple and tangy deep brown tamarind chutneys. These homemade relishes are a fitting prelude to the myriad flavours to come. 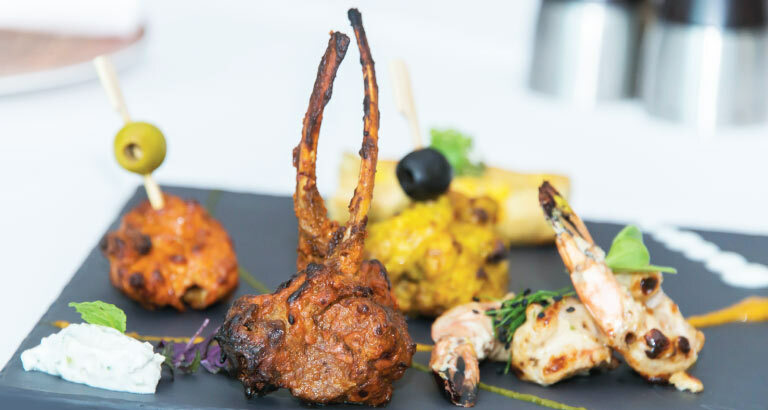 For appetiser, Chef Kuldeep suggested the Frontier Mix Grill - an assortment of mouthwatering kebabs presented on a slate-grey stone platter – ubiquitously Indian, but presented in a cool, contemporary way. 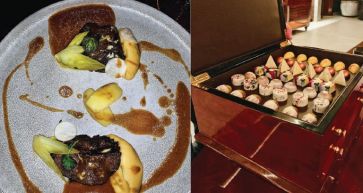 My favourites were the Tandoori Mutton Chop – a perfectly cooked rack of goat meat infused with Indian spices, and the Malai Jhinga – prawns in a creamy ivory masala that retained the fresh flavour of the ocean. The Murgh Malai Tikka did not disappoint, neither did the chicken and corn Seekh Kababs. Flipping through Rasoi’s menu, guests will appreciate the generous curation of vegetarian and non-vegetarian fare, breads, rice dishes and desserts. 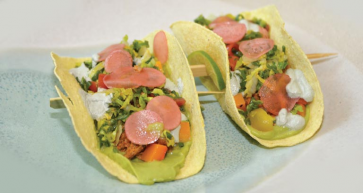 There are individual pages dedicated only to mutton, chicken, seafood and vegetarian kebabs respectively, saying a lot about the kitchen’s versatility. For mains, the Red Snapper Delight arrived first. In a verdant sauce sat a large chunk of the fish, its charred edges luring us to quickly dig in. The mildly sweet flesh was offset by the slightly bitter spinach and fenugreek sauce. The garnish of crispy fried greens added a different textural element to the dish. A clever deviation from the fiery red Murgh Makhani was the Hariyali Murgh Makahani – a moss green curry with a green tomato base. This is one of chef Kuldeep’s innovations that is a fine balancing act between sour, spicy and sweet and had us mopping up the creamy gravy on our plates with plump naan. The Dum Aloo Bhojpuri – potato and cottage cheese boats in a thick orange-brown gravy – is at once sweet with the raisins and piquant with the slivers of ginger and Indian spices. It makes for a genial vegetarian accompaniment. Rasoi’s Kacche Gosht ki Biryani was the highlight of our meal. The meat is marinated in yogurt and spices for 24 hours and then cooked along with superior basmati rice. This marination and the long hours of cooking over gentle heat is the secret behind the perfectly cooked, tender mutton and long grains of rice, transporting the taste buds straight into culinary heaven. Even after gorging on so much delicious food, I did not feel like a sitting block of lead. The food was not overdone with fat and spices, something that is easy to do with this particular cuisine. I jumped to the idea of sampling the Malai Kulfi that came highly recommended from among the many other tempting treats for dessert. The dense, creamy texture of this essentially Indian ice cream was not overtly sweet, perfect when eaten with the accompanying rose syrup and golden falooda (thick, homemade vermicelli). With its wholesome flavours and conveniently central location in Seef, Rasoi has just the right ambience in which to catch a quick working lunch or to entertain business associates. Sharing a meal with loved ones here is a great way to celebrate special occasions.